Gotham is saving a man from jumping off of the ledge and into the concrete below. Citing how he can fix this problem. if she would like some coffee, much to her displeasure she covers her ears and yells no, no, no! To which Alfred’s retort is “Perhaps tea, then?” (On a side-note, I love Alfred’s wit, thus far, in this run.) Duke comes in and comforts her, slightly.. As the page changes, we see Gotham trying to repair the bridge as part of what was blown up. “I can fix this, I can fix this..” Batman has now found him and tells him he is not an engineer, not an architect. He’s not the Mayor, he’s not the city council. All of which means that he cannot fix this. He can only make it worst..
Gotham takes extreme offense to the previous statement and throws part of the bridge into the Batmobile. 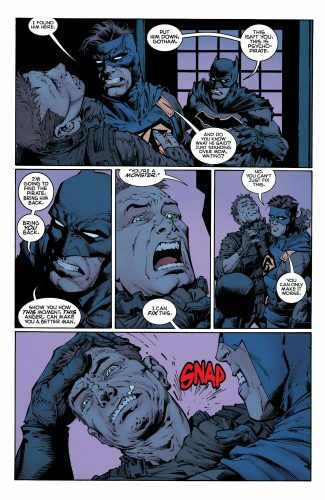 (Talk about anger issues…) Batman tells him of the twenty-seven bodies; massacred at his hands. It is then revealed that Gotham is indeed part of Task Force X.
Batman tells Waller how Psycho-Pirate could make the gods go mad, to which Waller expounds upon with “A man who could make the mad gods sane again.” She Tells Batman that she s aware of Gotham’s whereabouts and how he has killed 28 people in her unit. Sadly Batman was too late in stopping Gotham before finding his parents’ murderer, and Gotham snapped his neck. 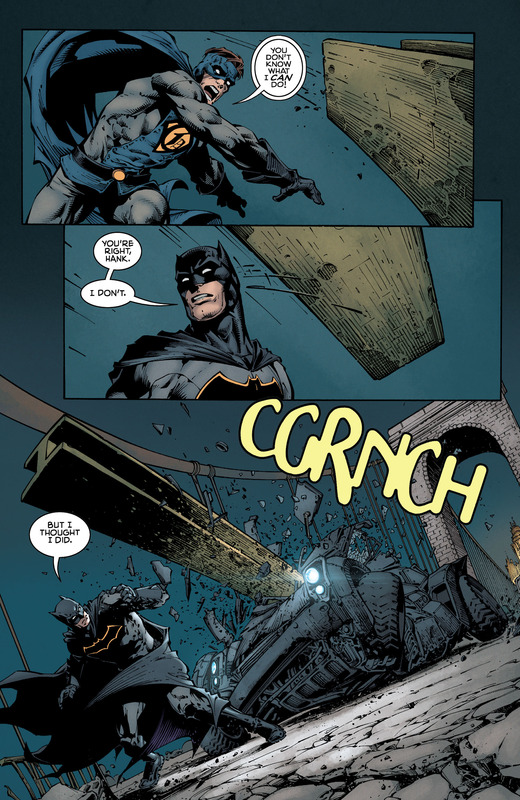 The issue ends with Batman fighting Gotham and Gotham saying: “I can’t save Gotham, Batman. But I can kill it before it hurts anyone else. Enjoy the article? Be sure to like the website, comment here, then head to our Facebook and Twitter accounts, and add Earth-7269!